A few notes: 1) No, Zoe did not miss her mouth and tried to feed her head. 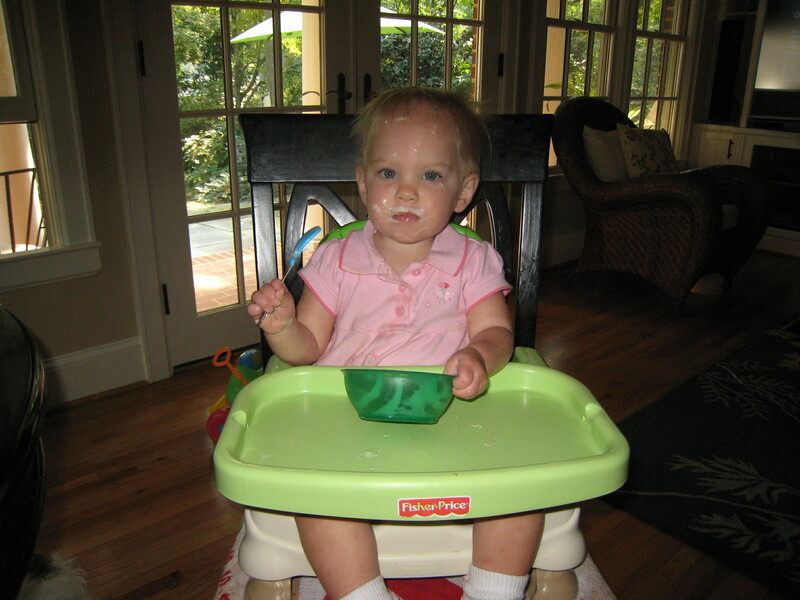 She was actually taught to drink the milk out of her cereal bowls (really, what was I thinking with that idea?! 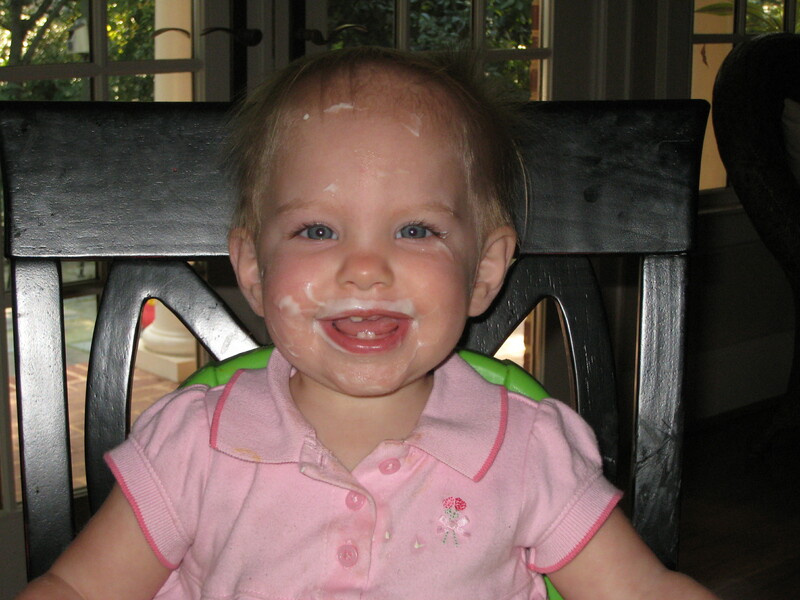 ), and she thought she could do the same with yogurt. I really didn’t have the heart to tell her that it wouldn’t work. 2) If you look really hard at her cheesy smile, you can now see 4 little toofies! YEAH!! Pre-Zoe, I was always of the opinion that you wait to cut a baby’s hair for the 1st time until it was in their eyes and bothering them. My opinion changed when Zoe’s hair decided to grow into a fabulous mohawk/mullet combo – great haircut from the ’80s, not so great for a little girl. 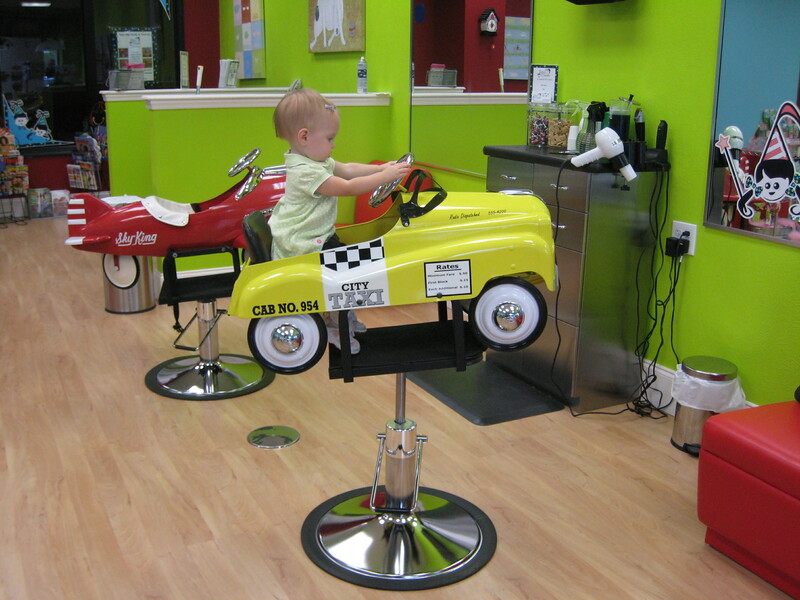 So, I finally took Zoe to Pigtails and Crew Cuts (https://www.pigtailsandcrewcuts.com) for her 1st haircut. 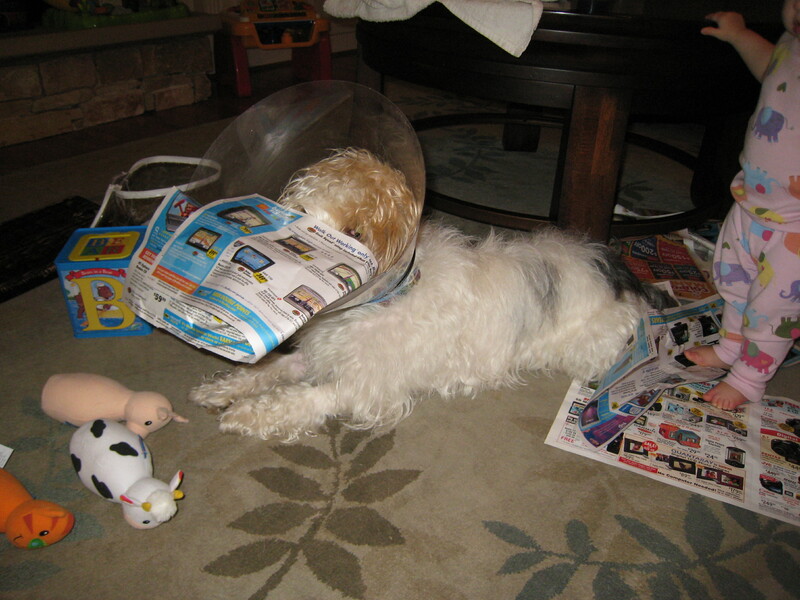 She did great – just sat there looking around while the stylist did a couple of little snips. 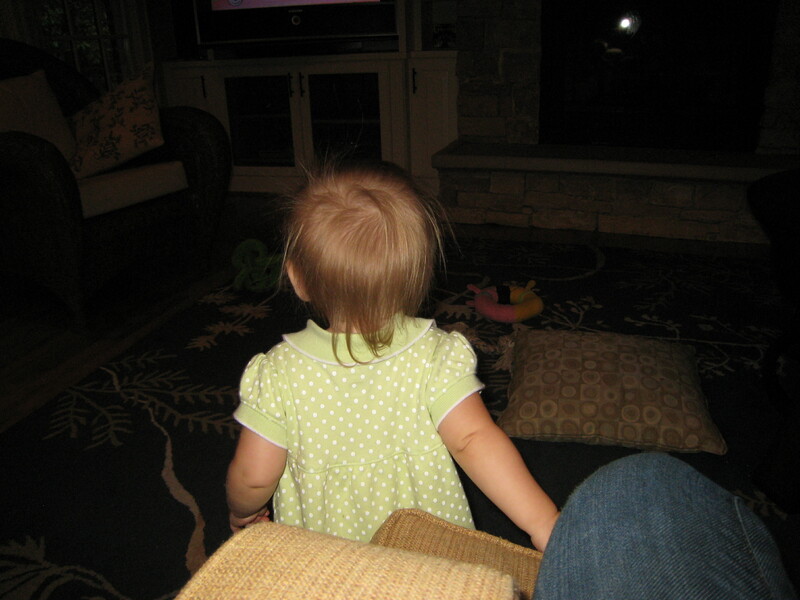 She no longer has the mullet, and the mohawk isn’t as obvious since the front was trimmed just a little as well. 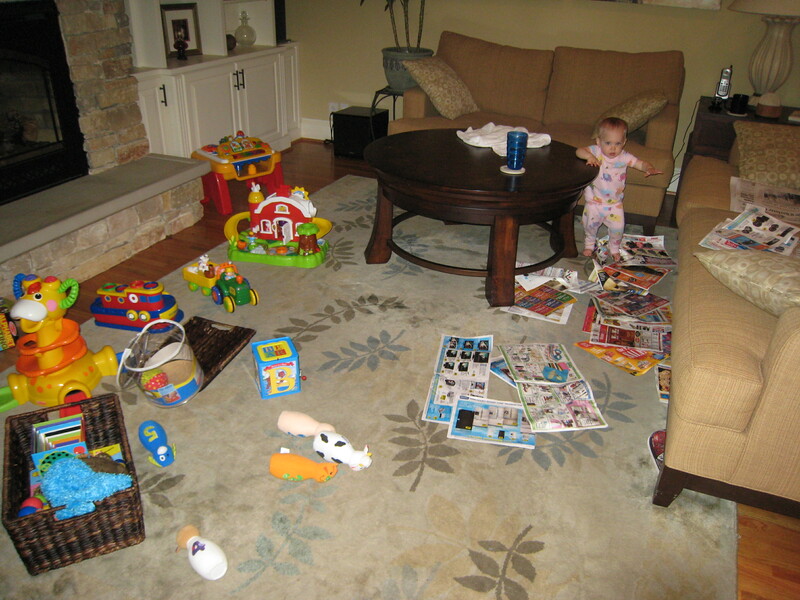 Before – I tried to get a profile shot, but of course, Zoe wouldn’t cooperate. 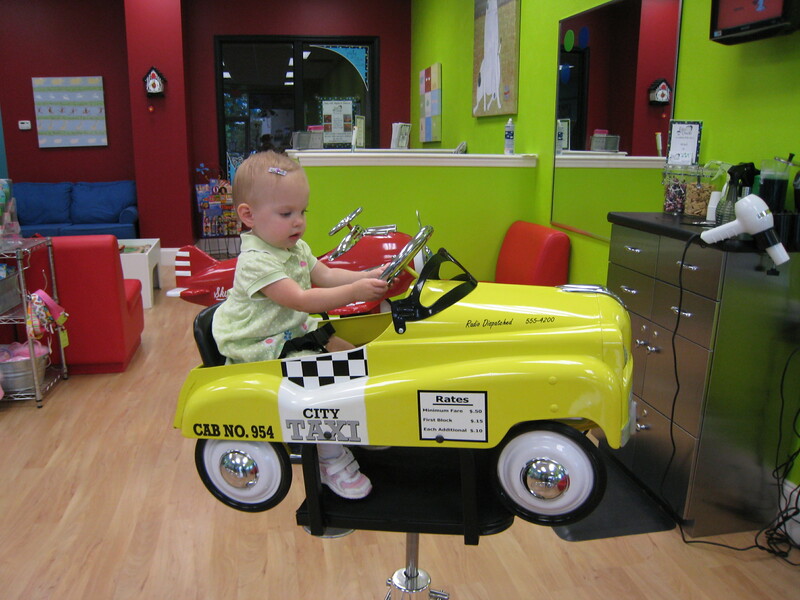 Zoe got to drive the yellow taxi while getting her hair cut. Check it out – no mullet!! 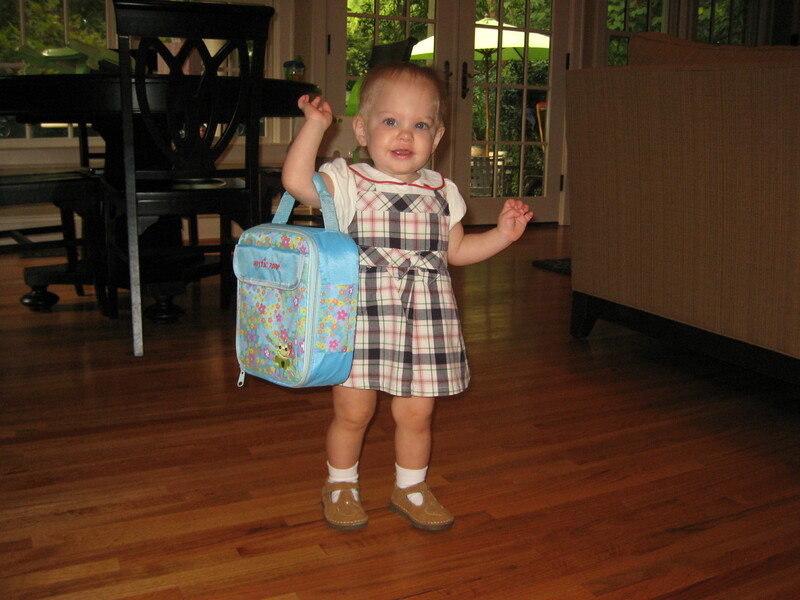 Zoe the schoolgirl with the lunch-box that’s as big as she is! 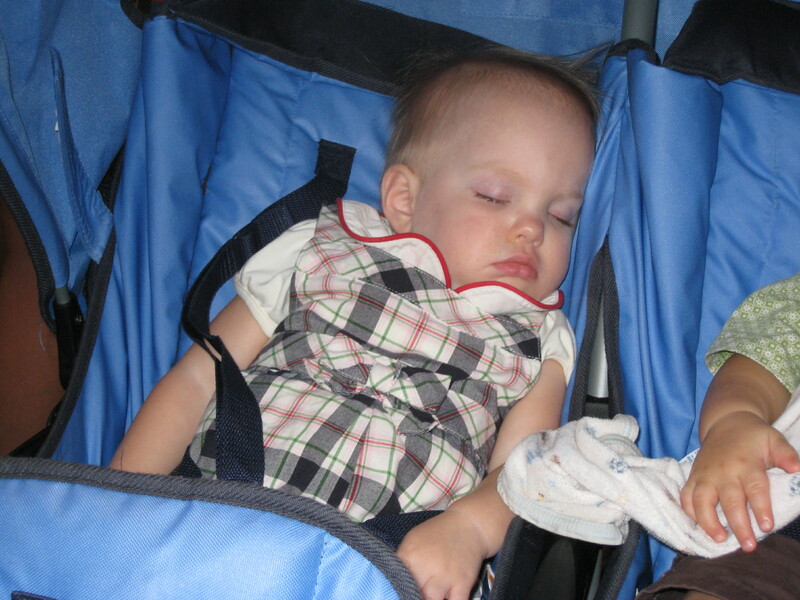 So, I went to pick Zoe up this afternoon, and this is what I found: Zoe sacked out in the stroller. Her teachers, Ms. Kissha and Ms. Lisa, as well as the director of the school, Ms. Susan, said that Zoe did really well without a single tear or melt-down. I have to add, there were no tears or sniffles on my part either! Soooo….I think today was pretty successful!! Zoe has learned that she can slide by herself! Of course, Kirk and I are close by, just in case, she decides to try and slide head 1st. Check it out! Since these videos were taken (about 10 days ago), Zoe is now able to climb up the stairs by herself, and slide down with control!